Written by Mickael S. and Tanya K.
The prominent products traded during 2015 on Russian underground forums were Ransomware programs and exploits targeting Microsoft Office. Prices on the Russian Underground have remained unchanged during the past two years, due to the vigorous competition between sellers on these platforms. Different kinds of services, such as digital signing for malicious files, injections development for MitM attacks and Crypting malware to avoid detection were also extremely popular on Russian forums. Check out the new Infographic from SenseCy illustrating key trends observed on Russian underground in 2015. A recent wave of ransomware attacks has hit countries around the world, with a large number of infections reported in the United States, the United Kingdom, Germany and Israel. It appears that the attackers have no specific target, since the attacks have struck hospitals, financial institutions and private institutions, indicating that no specific industry has been targeted. In Israel, two types of ransomware were identified in the most recent attacks: the familiar TeslaCrypt and the new ransomware, Locky. The vigorous usage of ransomware tools by cybercriminals and their success in this area has led to the development of new ransomware and the constant upgrading of known models. During the past several months, researchers have reported on the development of ransomware that is capable of file encryption without Internet connection, i.e., they do not communicate with their C&C servers for the encryption process. New ransomware tools that were reported are Locky ransomware, whose modus operandi resembles the Dridex banking Trojan, and a new version of CTB-Locker that attacks web servers. Additionally, RaaS (Ransom-as-a-Service) offers are becoming popular on closed DeepWeb and Darknet forums. These services allow potential attackers to easily create ransomware stubs, paying with profits from future successful infections. Recently, we identified a new RaaS dubbed Cerber ransomware, which is offered on a Russian underground forum. Previously it was ORX-Locker, offered as a service via a platform hosted on an .onion server. The majority of the distribution vectors of ransomware stubs involve some kind of social engineering trap, for example, email messages including malicious Office files, spam messages with nasty links or malvertising campaigns exploiting vulnerable WordPress or Joomla websites with an embedded malevolent code. The distribution also takes advantage of Macro commands and exploit kits, such as Nuclear or Angler. Sometimes browser vulnerabilities are exploited, as well as stolen digital certificates. In November 2015, attempts to deliver ransomware to Israeli clients were identified. In this case, the attackers spoofed a corporate email address and tried to make recipients believe the email was sent from a company worker. Train your employees – since the human link is the weakest link in the organizational cybersecurity and the majority of the cases involve social engineering on one of the employees, periodical employee briefing is extremely important. Specify the rules regarding using the company systems, and describe what phishing messages look like. Disable running of Macro scripts on Office files sent via email – in recent months, many cases of ransomware attacks employing this vector were reported. Usually, Macro commands are disabled by default and we do not recommend enabling them. In addition, we suggest using Office Viewer software to open Word and Excel files. Limit user privileges and constantly monitor the workstations – careful management of user privileges and limited administrator’s privileges may help in avoiding the spread of the ransomware in the organizational network. Moreover, monitoring the activity on workstations will be useful for early detection of any infection and blocking it from propagating to other systems and network resources. Create rules that block programs from executing from AppData/LocalAppData folders. Many variants of the analyzed ransomware are executed from these directories, including CryptoLocker. Therefore, the creation of such rules may reduce the encryption risk significantly. Install a Russian keyboard – while monitoring closed Russian forums where several ransomware families originated, we discovered that many of them will check if the infected computer is located in a post-Soviet country. Usually, this check is performed by detecting which keyboard layout is installed on the machine. If a Russian (or other post-Soviet language) keyboard layout is detected, the ransomware will not initiate the encryption process. Keep your systems updated – in many cases, hackers take advantage of outdated systems to infiltrate the network. Therefore, frequent updates of the organizational systems and implementing the published security patch will significantly reduce the chances of infection. Use third-party dedicated software to deal with the threat – many programs aimed at addressing specific ransomware threats are constantly being released. One is Windows AppLocker, which is included in the OS and assists in dealing with malware. We recommend contacting the organizational security vendor and considering the offered solutions. Implement technical indicator and YARA rules in the company organizations. We provide our clients with intelligence items accompanied by technical indicators. Additionally, a dedicated repository that includes ransomware indicators was launched. What if I am Already Infected? Restore your files – some ransomware tools create a copy of the file, encrypt it and then erase the original file. If the deletion is performed via the OS erase feature, there is a chance to restore the files, since in majority of the cases, the OS does not immediately overwrite the deleted filed. 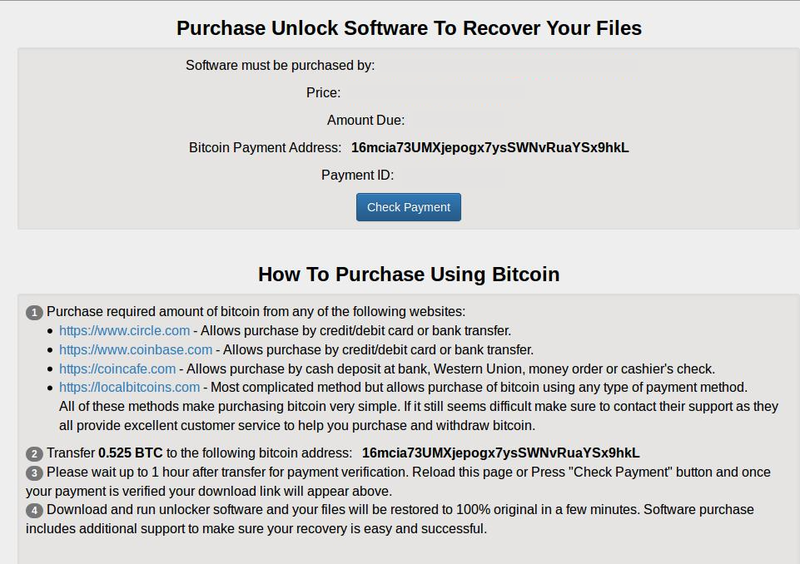 Decryption of the encrypted files – the decryption will be possible if you were infected by one of these three ransomware types: Bitcryptor, CoinVault or Linux.Encoder.1. Therefore, detecting the exact kind of ransomware that attacked the PC is crucial. Back-up files on a separate storage device regularly – the best practice to avoid damage from a ransomware attack is to backup all your important files on a storage disconnected from the organizational network, since some ransomware variants are capable of encrypting files stored on connected devices. For example, researchers recently reported a ransomware that encrypted files stored on the Cloud Sync folder. If ransomware is detected in the organization, immediately disconnect the infected machine from the network. Do not try to remove the malware or to reboot the system before identifying the ransomware. In some cases, performing one of these actions will make the decryption impossible, even after paying the ransom. Written by Ran L. and Mickael S.
The bar for becoming a cyber-criminal has never been so low. Whether buying off-the-shelf malware or writing your own, with a small investment, anyone can make a profit. Now it seems that the bar has been lowered even further with the creation of a new Darknet site that offers Ransomware-as-a-Service (RaaS), titled ORX-Locker. Ransomware-as-a-Service enables a user with no knowledge or cash to create his own stubs and use them to infect systems. If the victim decides to pay, the ransom goes to the service provider, who takes a percent of the payment and forwards the rest to the user. For cyber-criminals, this is a win-win situation. The user who cannot afford to buy the ransomware or does not have the requisite knowledge can acquire it for free, and the creator gets his ransomware spread without any effort from his side. This is not the first time we have seen this kind of service. McAfee previously (May, 2015) reported on Tox. While Tox was the first ransomware-as-a-service, it seems that ORX has taken the idea one step further, with AV evasion methods and complex communication techniques, and apparently also using universities and other platforms as its infrastructure. In the “August 2015 IBM Security IBM X-Force Threat Intelligence Quarterly, 3Q 2015,” published on Monday (August 24, 2015), IBM mentioned TOX while predicting: “This simplicity may spread rapidly to more sophisticated but less common ransomware attack paradigms and lead to off-the-shelf offerings in the cloud.” Just one day later, a post was published on a closed Darknet forum regarding the new ORX-Locker service. On August 25, 2015, a user dubbed orxteam published a post regarding the new ransomware service. The message, which was part of his introduction post – a mandatory post every new user has to make to be accepted to the forum – described the new ORX-Locker ransomware as a service platform. In the introduction, the user presented himself as Team ORX, a group that provides private locker software (their name for ransomware) and also ransomware-as-a-service platform. ORX Team introduction post in a closed Darknet hacking forum. Home – the welcome screen where you users can see statistics on how much system has been locked by their ransom, how many victims decided to pay, how much they earned and their current balance. Build EXE – Team ORX has made the process of creating a stub so simple that the only thing a user needs to do is to enter an ID number for his stub (5 digits max) and the ransom price (ORX put a minimum of $75). After that, the user clicks on the Build EXE button and the stub is created and presented in a table with all other stubs previously created by the user. ORX-Locker Darknet platform, which enables every registered user to build his own ransomware stub. Stats – This section presents the user with information on systems infected with his stub, including the system OS, how many files have been encrypted, time and date of infection, how much profit has been generated by each system, etc. Wallet – following a successful infection, the user can withdraw his earnings and transfer them to a Bitcoin address of his choosing. Support – This section provides general information on the service, including more information on how to build the stub and a mail address (orxsupport@safe-mail[. ]net) that users can contact if they require support. When a user downloads the created stub, he gets a zip file containing the stub, in the form of an “.exe” file. Both the zip and the stub names consist of a random string, 20-characters long. Each file has a different name. As you can see, some of the addresses are related to universities and others to organizations with various agendas. Upon activation, the ransomware connects to the official TOR project website and downloads the TOR client. The malware then transmits data over this channel. Using hidden services for communication is a trend that has been adopted by most known ransomware tools in the last year, as was the case of Cryptowall 3.0. In our analysis, the communication was over the standard 9050 port and over 49201. The final piece would be the encryption of files on the victim’s machine. Unlike other, more “target oriented” ransomware, this particular one locks all files, changing the file ending to .LOCKED and deletes the originals. When the ransomware finishes encrypting the files, a message will popup announcing that all the files were encrypted, and a payment instruction file will be created on the desktop. In the payment instruction file (.html), the victim receives a unique payment ID and a link to the payment website, located on the onion network (rkcgwcsfwhvuvgli[.]onion). After entering the site using the payment ID, the victim receives another set of instructions in order to complete the payment. ORX-Locker payment platform, which has a dedicated site located on the onion network. Finally, although some basic persistence and anti-AV mechanisms are present, the malware still has room to “grow.” We are certain that as its popularity grows, more developments and enhancements will follow. When we talk about Brazil, we no longer think only Carnival and caipiriña, or the favelas (slums) that came into being as a result of the highly unequal distribution of income. Bearing in mind that Brazil is one of the largest countries in the world, a major new concern has arisen as the Internet and technological devices are being used to find fast ways to earn money. 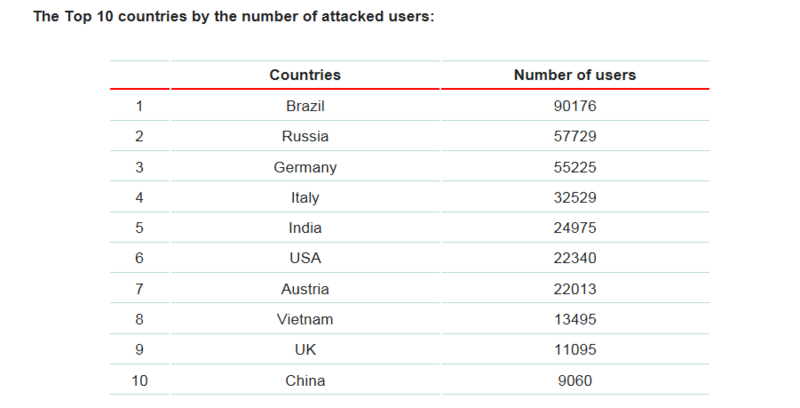 In 2014, Brazil was listed as the country with the most number of attacked users. Kaspersky identified over 90,000 attacks in Brazil, with Russia in second place. Cybercrime has combined the creativity of Brazilian hackers with new forms of illegal activities, specifically online bank fraud, turning the country into a producer of Trojan malware. The increased variety of Trojans produced in Brazil is becoming a trend. Hackers are spreading their tools via hacking communities, by selling or simply sharing tools, tutorials and tips for using Trojans as a means to intercept information on users and their banks. They use social network platforms, personal blogs or “security information web sites,” IRC channels and the forums on the deep web where “laranjas” (oranges in Portuguese, used to denominate a tool/card trader) do business to sell the malware or the stolen data. While hackers from other countries use malware tools such as Zeus, the uniqueness of the Brazilian hackers is that they develop specific, personalized codes targeting banking frauds. They also find creative ways to use software to access their targets, with the aim of stealing bank accounts. CPL is one of these innovations – a legitimate Windows Control Panel file is being used by cybercriminals to spread banking Trojans targeting Brazilian users. Cybercriminals send fake emails, using social engineering techniques designed to mislead users. 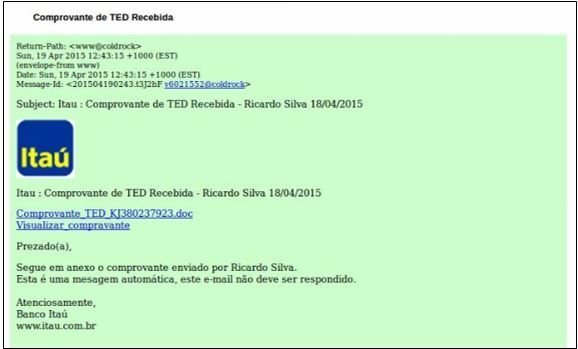 Usually, the email content is a document with a quotation, invoice or receipt, information on a debt or a banking situation, or digital payment instruments used in Brazil, such as Boleto bancário or Electronic tax note, file photographs, videos or similar. The fact that Brazil has the highest percentage of online banking users has also contributed to the development of different personalized attacks. As a result, banking Trojans have become the number one threat in Brazilian cybercrime. As previously demonstrated in the Brazilian malware arena, some code writers spread their viruses around the world. The security sector, in this case the banking sector, must be aware of the possible dangers and increase their efforts to protect their clients. Russian underground forums often serve as a marketplace for talented coders of sophisticated malware who develop attack tools to target the financial industry. 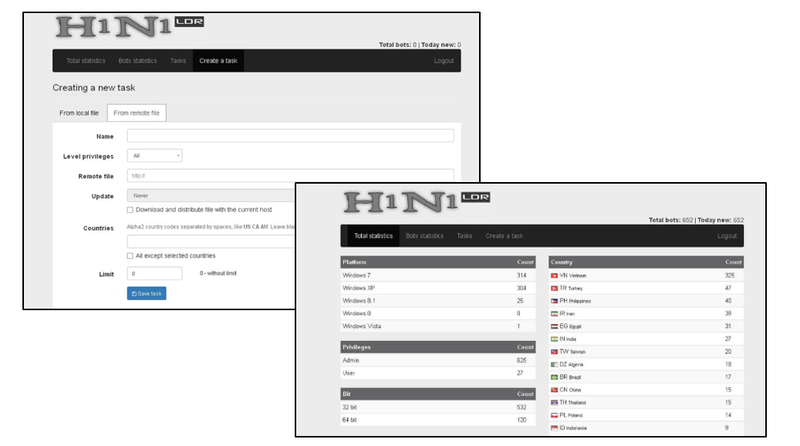 During routine monitoring of these forums, we came across a new type of malware loader called H1N1. Loaders are used as an initial intrusion vector, enabling an attacker to install malware on a workstation at a later time of his own choosing. They provide the attacker with both an initial foothold in the victim’s system and a future channel for delivering malicious programs at any time. The new loader, which is named after the swine flu virus, was offered for sale in late April for $500 by a member of a Russian password-protected forum. Bypasses User Account Control (UAC) through a UAC whitelist, which allows it to run files with elevated privileges. This bypass does not require use of additional .dll libraries or Windows Sysprep. If the loader is unable to receive elevated privileges, it will run programs with user privileges. Traffic in both directions is encrypted. Installs .exe files on the infected computer using Windows Instrumentation Management (WMI). The .dll files are installed from memory. Has an embedded security mechanism that recognizes when it is being executed in a virtual machine. Can be injected into the address space of legitimate system processes (of the default browsers). Bypasses AV and HIPS programs. With AV programs, it does this by identifying their running processes and paths, creating copies of the processes, injecting into the copied processes, and finally, disabling all threads of the AV software’s legitimate processes. Elevates privileges from a low integrity level by using WMI and exploiting the CVE-2014-4113 vulnerability. Identifies and neutralizes certain AV programs. A number of forum members who claimed to have used the tool gave generally positive feedback but stated that it does not bypass all AV programs. According to the technical analysis (below), Kaspersky Internet Security identified the presence of the loader, while ESET NOD32 and Outpost Security Suite did not. Avira only identified the activity as malicious in some cases (depending on the crypt of the loader). In a VirusTotal analysis of the loader’s files, the detection ratio was 41/57 for the dropper file (as of May 21, 2015) and 22/57 for the memory file (as of May 14, 2015). It is common practice on closed Russian forums for veteran, trusted members to analyze and validate malware sold by newbies to prevent them from cheating and selling a low-quality product. It is harder to find buyers for non-validated malware, especially if the seller is new to the forum (for a review of different types of sellers, see our previous post on this subject). Since a major part of the underground ecosystem is based on reputation and the hierarchy on different underground forums, an impartial entity whose role is to validate new goods is extremely important. Ares, the administrator of a well-known Russian forum, conducted a validation analysis to check whether H1N1 really possesses the capabilities claimed by the seller, including the ability to bypass security measures. He published an extensive review on his forum. According to Ares, the code is written in Assembly language and was obfuscated (for security purposes). Once all the initial procedures are loaded (the code utilizes kernel32 and advapi32 during loading), the loader launches the Explorer process from syswow64 on x64 systems and system32 on x86 systems. The process is mapped with a rewritten shellcode entrypoint. The shellcode receives all of the necessary APIs and reads a packed binary file (which it extracts). The binary is a .dll file that scans for various important API elements and then checks the hash signature of the filename through which the process was started. If the file name is Explorer, it tries to elevate its privileges. Initially the malicious .dll file copies itself and patches with the shellcode. Later it moves the copied file into the system32/setup folder. After that, H1N1 runs several checks (such as OS version) and tries to elevate its privileges from medium to high. The loader uses various methods to inject malicious content into legitimate processes. For example, if injection into a default browser fails, it tries to inject the malicious content through svchost. Lastly, the execution module kicks in where the loader will be executed. The malware conducts fake network tests (for example, pinging various websites), collects information about the infected machine, and then requests content from the C&C server. The HTTP requests are encrypted with RC4 and the data length is transferred in the HTTP header. Following publication of the analysis by Ares and in response to critical feedback from forum members, the seller has been updating and improving H1N1. For example, he responded to criticism of the UAC bypass by announcing that he had changed the bypass method and that it was now similar to the method used by the Carberp Trojan. In later tests performed by several authoritative forum members, privilege escalation and the UAC bypass had a relatively low success rate. However, since then, the author claims to have fixed the problems with the loader. H1N1 uses bthudtask.exe for its purposes. This executable is part of Microsoft Windows and is usually located under C:\Windows\system32. The file description is “Bluetooth Uninstall Device Task.” If you do not require Bluetooth devices, we would strongly recommend removing the file from your end-points. H1N1 is a new type of malware loader and is not yet very sophisticated. However, it has attracted the attention of many high-ranking Russian underground forum members, who have analyzed it and written about its weak points. This seems to be encouraging the seller to improve and upgrade his product and fix the bugs. Russian underground cyber-markets are known venues for purchasing high-quality hacking tools and services. Many such tools, popular worldwide, make their first appearances on closed Russian forums. There are two main types of sellers on these platforms: well-known members with seniority and strong reputations, who have already sold tools and received positive buyer feedback, and an emerging “shell profile” type of user. According to our recent analysis, such users typically register to a forum a few days before posting an advertisement for the tool. These new users often enlist the aid of forum administrators and more senior members, by providing them with a copy of the tool for their review, and thus gain the trust of potential buyers. For example, CTB-Locker, a malware program, was first advertised on a Russian underground forum on June 10, 2014 by a user called Tapkin. This ransomware scans the computer for data files, encrypts them with a unique algorithm, and demands a ransom to release them. Tapkin registered on this forum on June 2, 2014, several days before posting the advertisement, and posted a total of five messages to the forum, all on the subject of CTB-Locker. Around this time, a user by the same name posted identical information on other forums. Tapkin registered to another Russian underground forum on June 13, 2014, and three days later, he advertised the tool on the forum. This was the first and only thread that Tapkin started on this platform, and all of his posts were about this topic. Tapkin stopped selling CTB-Locker on June 27, but on November 19, 2014, he posted another advertisement, this time for “serious” clients only. Tapkin last advertised the ransomware on a carding forum on December 8, 2014, after registering to this forum the same day. Thus, in three cases, Tapkin registered to a forum a few days before posting an advertisement for the tool and did not participate in any other forum discussions. As a newly created profile, Tapkin lacked seniority and therefore had low credibility. However, our impression is that this user demonstrates knowledge regarding the tool, its capabilities and can answer questions regarding the technical component of the tool fluently. An analysis of Tapkin’s posts indicates that behind the shell profile is not one person, but rather a group of people who developed the tool together. This username appears to have been created for the sole purpose of selling the ransomware, which was only advertised on Russian-speaking platforms. On May 19, 2015, a well-known forum user posted a message stating that his computer had been infected by CTB-Locker and asking for Tapkin. However, Tapkin had by then already disappeared. Another example of malware advertised by a new forum member is the Loki Bot password and coin wallet stealer. Loki Bot, written in C++, can steal passwords from browsers, FTP/SSH applications, email accounts, and poker clients. It has an option to configure C&C IP addresses or domains. This bot, which works on Windows versions XP, Vista, 7, 8, and 8.1, is relatively new and is still under development. It was first advertised on a well-known Russian underground forum in early May 2015 by a new user with no reputation. A week later, a user by the same name registered on two other well-known underground forums attempted to boost his credibility by sending the forum administrator a test version of the malware. Similar to the previous example, we assume that a group of people is behind this user as well. We can see that new users are registering on Russian underground forums for one purpose only, to sell a particular malware program, and their entire online presence is focused on this. They register to a forum a few days before posting an advertisement for the tool and do not participate in other forum discussions. Newly created profiles lack seniority and therefore have low credibility ratings. Sometimes such users attempt to improve their credibility by sending the forum administrator a test version of the malware. In some cases we can see that behind the shell profile there is a team, and not an individual. They appear suddenly and disappear just as suddenly after their business is completed.